Slow day. Vincie had a little cold, so we spent the day in bed nursing and napping. I think he'll feel better tomorrow. 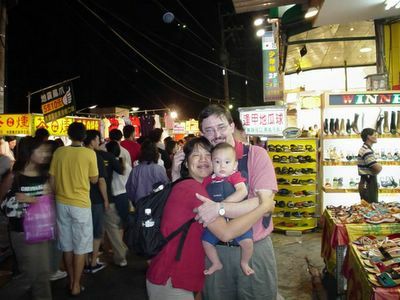 Us at the night market, Vince was touched by a million people tonight. Carrie and Asuka at night. This weekend we went with our friends Asuka and Carrie to Taizhong to see the Kong Zi (Confucius) temple. Saturday was his birthday. He should be about 2553 years old now. The temple was quite grand, and very peaceful. We understand that there was a big ceremony there at 6AM, but we could not make it quite so early. Next year I (Jeremy) am determined. It is on Sunday, 9/28/2003 at 5:30AM and anyone else who is interested in very invited to join me. In addition to our visit with Kong Zi we went to the night market at the big university there. It was very lively and crowded, and quite a lot of fun. Vincent was strapped to my chest, and there must have been at least 100 people who said hello to him as we walked by. He loved it, and we all had a great time and tried many different good foods. We also visited Carrie's cats, who are in quarantine in Taizhong. That was a bittersweet event for us, and reminded us how much we miss Yeager, but it was nice to see them reunited. We may cat sit for a week or two once the quarantine is over until their apartment is ready. This morning we toured around Taizhong a bit more, and visited the big Japanese department store Sogo. The store reminded Asuka of his childhood visits in Japan. Rained a lot this afternoon, Vince slept for about 4.5 hours this afternoon! We went out to dinner at our local Chinese place down the street. Watched the beginning of MI:2 on HBO and played a short game of Trivial Pursuit. Spent time in the afternoon with Helen and Ms. Liu in the realtor's office. They are working on moving Droopy's parents into their apartment. It's been quite a bother, they've had to send furniture back 4 times already. Helen got her hair permed, it looks really good. Vincie crawled on the office floor for about an hour; he goes after all the shoes and electrical wire he can find. We drove into town after dinner to the special baby shop and got Vince some crackers and some more chew toys (just like a doggie these days...). He did something I've never seen him do before; as we were walking into the store, he started bawling like something really frightened him. I've never heard him cry with such anguish, big tears rolled down his cheeks. 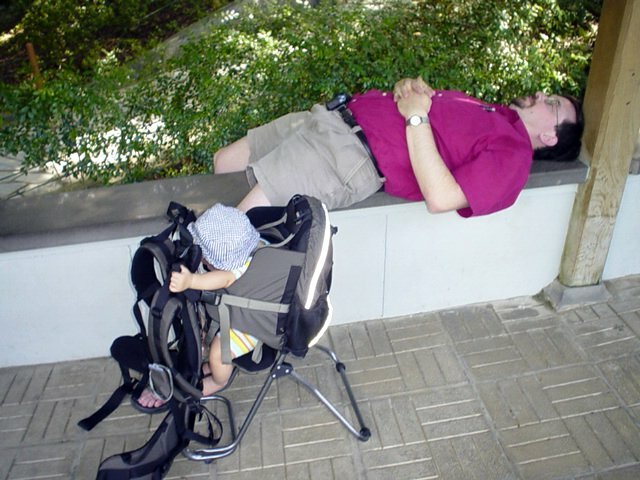 By the time we left, he was OK, but it was really weird. Today was a quiet day. We spent the morning at home, talking with family and friends. Then we went out shopping for food. Jeremy doesn't get to go to the market as much as he did in Austin, and was really missing being able to choose food from a grocery store. So we went and got lots of spaghetti sauce, jam, cheese and cookies (all kind of specialty items here in Taiwan). After lunch, we took a nap and had a simple dinner. We are a little bit homesick this weekend, so we found VCDs of Season 3 of "Friends" and have been watching old episodes. It makes us feel all warm and fuzzy inside, mmmmmmm, all our familiar old TV pals, they say such funny things. There is apparently a big party going on downtown for the Mid-Autumn Moon festival, but Taiwan stays up later than we do, so we are passing on the big festivities (at least tonight). 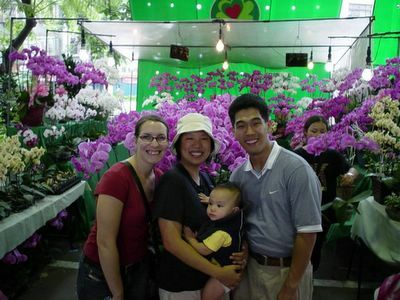 At the flower market in Taipei. Happy Mid-Autumn festival! We went to Taipei today to see Asuka and Carrie, who just moved here last week. They found a lovely place in Taipei and are waiting for all the details to be worked out. Turns out the Browns were also staying in Taipei, we bumped into them and into Kin-Sang in the lobby. We all chatted, then we went to Din-Tai-Fung to eat a delicious meal at about 10:45. Then we went to the Jade and Flower markets. 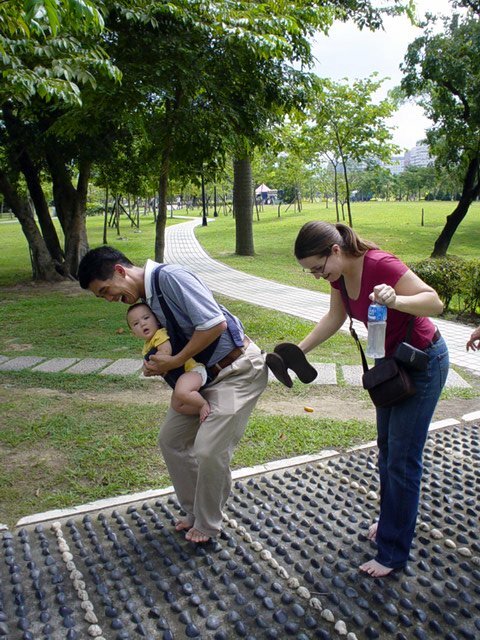 Then we went to Da-An park and walked around, we had a foot massage via the accupressure stones in the ground. Then we went back to the hotel for a snack, then to Cave's bookstore. Then back to the hotel for some Vince crawling time. The neighborhood near the hotel is super posh with Louis Vuitton, Escada, etc... Drove back and saw Ms. Liu, she gave us some moon cakes, she's working very hard this holiday weekend. My Chinese lessons with Mr. Hung, the security guard downstairs are going great. He helps me everyday with my lessons and I get to alleviate some of his boredom during the day. I met Jasmine today, a lady with two kids who are half Asian and half Caucasian. 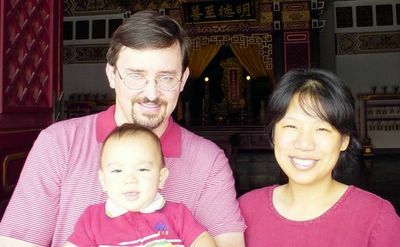 Her husband is a techy guy who also happens to be a Morman, so he is fluent in Chinese because he did his mission in Taiwan. I also helped Roger, a white guy working for Pressco, a tool maker for food and beverage packaging companies, jump his car. He lives on the 17th floor of our building and he's here maybe 100 days out of the year, the rest of the time, he's traveling all around Asia. He owned a beat up old Peugeot. This afternoon I drove (!) to the Lakeshore hotel and attended the Mid-Autumn festival of the International School. Ms. Liu was very busy today, no time to talk with me. She's managing three house moves this weekend. Lot's of phone calls to make and lots of things to arrange. Dad got on Yahoo! Messenger today, that's pretty funny. Watched a lot of Chinese children's television. Also met Droopy's mother, Sue. Today is Tu-Di-Ma's birthday, so there is a big party going on in the temple behind our apartment complex. Today I saw a puppet show, but I didn't understand it at all because it was all in Taiwanese. We went out to dinner with Johannes tonight at the Japanese BBQ place. Vincie was a squirm-meister tonight. Ran into Kay Dee at the rt mart today, we had lunch at mcdonalds and chatted about how things were going for both of us. I saw the mayor of Hsin-Chu. He was outside our apartment where a new highway has opened. It has only been open for two days, and there has already been an accident. He was discussing what should be done about it with a TV camera crew. I watched the local news, but I didn't see myself. Vince got his 6 month shots today. What a big boy! 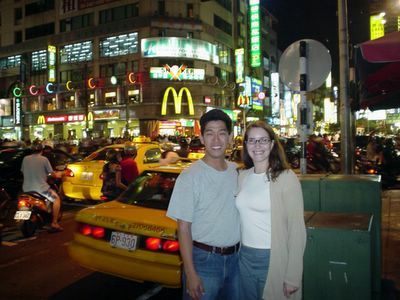 It was my first medical experience in Taiwan. I thought I was going to be able to avoid seeing Vince getting his shots, but I ended up holding his leg in place. Jeremy did the biggest job by holding him in his lap and his arms. The doc was very nice. No more shots until 9 months! We had lunch with a couple, Erdam and Eloina, who work at Infinion, the third company associated with AMD and UMC. The have a cute 10 month old, Victoria. They are an interesting family, Elonia is Brazilian and Erdam is Turkish and German. So Victoria will have to learn: English, Turkish, German, Porteguese and now Chinese. We ate at a Japanese retaurant in the Science Park as they are staying at the Lakeshore Hotel. Lunch we really good and the kids had fun playing around each other. Vince hit his head against a wood railing and got his first real "goose egg" on his head. Then we drove around and found the Orange Mart and bought some baking powder and baking soda. They are impossible to find around here. I made some banana bread from some over-ripe bananas I had. Jeremy installed speakers from the computer in the dining room, so we listened to Car Talk while we ate dinner. We celebrated my 30th birthday by driving into Taipei and going to the National Palace Museum. Man Fai came with us. We planned to leave at 8:30 am and got to the gate of the museum by 10:30 am. We had a snack at their tea house and went through the 2nd and 3rd floors. The creepiest thing I saw was in the Buddhist exhibit where they had taken monk's skulls and cut off the top part where the brain is housed and turned it upside down, lined it with gold and precious stones and turned it into a bowl. Bleech! Jeremy and I were running out of steam quickly and Man Fai wanted to see the rest of the museum, so after lunch, Jeremy and I took a tour of a nearby park while Man Fai toured the bronze section. We fed fish and took a nap. Then we decided to head to the paper museum downtown, but traffic was so bad we abandoned that idea and headed home. We came back to Hsinchu and Jeremy did his first set of illegal parking/driving moves to buy me a birthday cake and some buns for dinner. Saw the kids from the day care attend a rollerblade class outside in the apartment complex courtyard. Went exercising today at the spa, ran about 2.5 kilometers, not a bad start. I spent the afternoon with Yvonne, the expat coordinator for AMD, and George, our driver, and pretended not to know Chinese when we were filling out our visa extension applications. A bit frustrating when they are talking about you and they think you don't understand but you really do and they are saying mildly preturbing things about you. Then I spent the bulk of the afternoon making scallion pancakes from scratch! I even got the two kinds of flour they recommended, cake and all purpose. They came out with just the right texture, but needed a bit more salt. They were perfect with the stir fried beef that we made, the juice from the beef and the crunchiness of the scallion pancakes were good together. I prepped all the ingredients and Jeremy came home and did all the actually stove work. So today all the wives went to Taipei to get a physical so we can get our resident alien cards. Woo hoo! We got a chest X-ray (ugh! ), blood tests, stool samples and urine samples. They had all the bodily fluids covered. The bummer thing that I found out is that I need eyeglasses! That'll be a change for me. I guess I'll get them sometime this week. I've known for some time that my perfect vision was starting to fail me, but this confirms it. We all then went out for lunch at TGI Fridays and then the two Taipei wives (Lora and Christine) went to pick up their kids from school and the two Hsinchu wives (Fran and me) went shopping! We went to caves book store, I bought Jeremy a chinese cookbook with his favorite shrimp wrapped in rice noodles recipe. Also splurged on an English book for him. At Costo, I'm not finding too many things I need there, I'm getting a big kick from shopping at the local traditional market everyday. The fruit guy and the chicken ladies are starting to know me. The vegetable ladies don't know me yet, but they will. It's pretty hard to miss Vince and me, I'm carrying him in our backpack. In the picture is Fran, Christine and her son Dakota and me. Got up early this morning, Jeremy's daily taxi driver gave him about 20 buns this morning, still piping hot from the steamer. Man Fai also got 20 buns, hee hee! So much to eat, I ate one and dispersed the rest. One to our security guard, Mr. Hong and the rest to the Elephant Daycare, where I hope all the little kids will eat them. 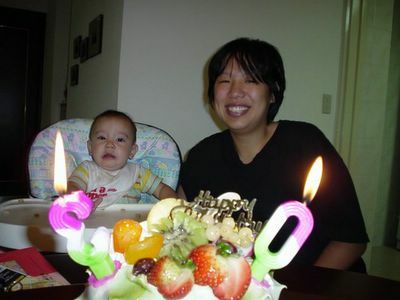 Jeremy took Helen's cakes that she got from Tai-chung and shared them with his coworkers. Apparently they are very famous. I had one and it was really, really good. We hung out at the Daycare for about 30 minutes. It's funny to see how some kids react to being dropped off, some are wailing and crying, others are all calm and collected. 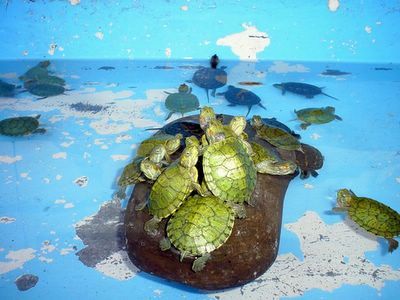 They are getting used to me hanging out there, I'm helping out in the tiniest ways, making a bottle, conforting some tykes. It's nice. Then I dropped Vince off at the nannys and I went and joined the Carlton Spa. I am a Spa lady :) Woo hoo. I'm going to start running this week, thank goodness. It'll be good for my mental health. Then I spent some time studying Chinese in the front lobby of our building with Mr. Hong. Then I picked up Vince. We spent the day crawling all over each other, took a late nap. 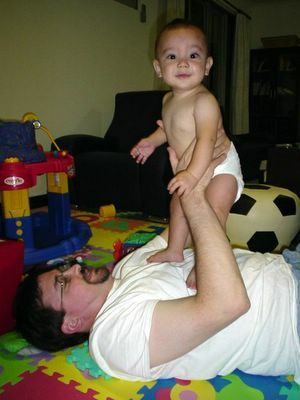 We were going to go to the pediatrician tonight (they are open until 9 pm! No appointment necessary. ), but Jeremy had a tough day today and I am planning on going to Taipei tomorrow, so perhaps it was OK not to get vaccinations today. I had my dictionaries all ready in case of translation issues. So today was the first day that Vince went to the nanny. For two hours in the morning, he was away from me. I used the time to exercise and study Chinese. OK I thought about exercising, I didn't really exercise. Then we took a nice nap and spent the afternoon waiting for the water bottles to come and talking to Ms. Liu and Droopy. She was burning paper money like she does every first day of the lunar month (although this time she was a few days late.) I'm contemplating hosting and English speaking potluck for Holland Village. Got up *late* today. Got the car jumped by the realtors and had to turn down an offer to go playing with them because they were going to get back after dinner and we had plans with Helen for dinner. We went driving and bought some gas. Also went and parked near the university and had lunch and bought some coffee for Jeremy. Then we bought some dessert for Jeremy's birthday and headed home. 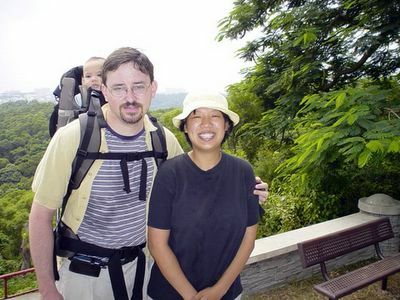 Spent some stressful hours working on our expense report and then Helen called and said she had just come home from Tai-Chung and wanted to rest before coming over, so we went shopping just the three of us. We headed back home without finding black bean paste, but our security guard, Mr. Hong found other tenents in the building who had some for us! Then Helen came over and we played for hours. It was fun. She seemed surprised that Jeremy was 34. She thought he was 40 at least. Hee hee, she didn't realize that Jeremy was only 2 years older than her. Vince *loves* Helen. Stayed up late and smiled and smiled at her. She's teaching Jeremy how to cook lots and lots of dishes. Today we waited and waited for typhoon Sinlaku to come. She never made it here, actually, it barely rained. We spent most of the morning indoors. In the afternoon, we went to the RT mart to buy some food and supplies. We also hung out in the realtors office and saw their hamsters. Jeremy tried out his new Chinese vocabulary. "Too fat!" They are moving into the office for 3 nights because Droopy's owner is going on a business trip and won't be back until Wed. They are so sweet :). They also helped us order Chinese food for dinner. Man Fai came over and we watched "You've Got Mail" on HBO. Vince is very loud these days. We are both tired and it's only 8:30. Waiting around for the typhoon. Jeremy got off work at 11:30am. It's 10:30pm now and no rain yet. Today I went to the fish market with Kay Dee. Also went to RT mart, Home Box and Orange. I had a nice time, although Vincie was tired. Also had a ride home with Fran and we talked a bit, which was also nice. Trying to learn Taiwanese from George, the driver. Vince and I took a long nap. Jeremy had dinner out tonight. Today we got a car! Tonight, Man Fai, Jeremy, Vince and I took an inaugural trip to the Science Park and tried to park near a night market. No luck. Also had a tuna casserole as a memorial to the Yeagermeister. I had to go to SOGO to get the tuna. Ha! 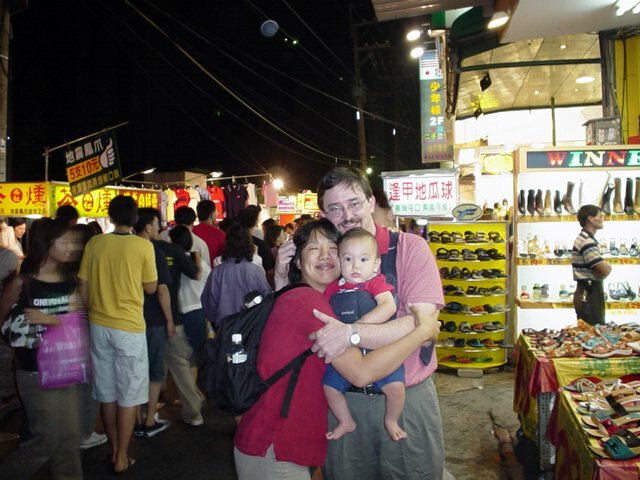 When we got there, we reveled in the air conditioning and found out it was Charlene's last day in Hsinchu, so she came over and played with Vince. That's Charlene and Selina in the blurry photo. We had a good time there and had a bit to eat in the food court downstairs. Then we went home and I tried to participate in the Holland Village water olympics but I didn't have a cap on, so I got kicked out of the pool. Who knew you had to wear a cap. The we walked through a crap fair, I think it was still early, so not a lot of stands were set up, but there were some turtles for sale. Then we kept walking towards the Ambassador. Today we went and climbed the local mountain here in Hsinchu. The name starts off "18-something mountain". I'm not sure what it means. We had a nice time walking up steps and seeing everybody out with their kids. We saw a bunch of people playing the chinese flute. Then we decided to wander down the mountain towards the Ambassador hotel. It was only 10:30, but I was dying of hunger, so we stopped at a 7-11 and I bought this seaweed-wrapped rice triangle that I've seen advertised on TV. The packaging is very clever, they wrap it in a way so that there is plastice between the rice and the seaweed, so the seaweed stays crispy.